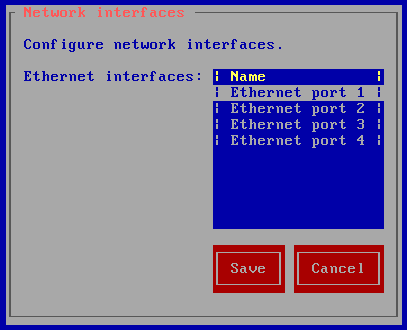 Configure network interfaces for your Smoothwall in addition to the one setup during installation for administration access (see Software Installation). 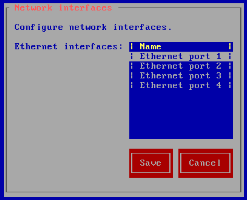 You can change the Network interface controller (NIC) used by the administration user interface to access the Smoothwall (see Software Installation). You can either restore configuration during installation, or after the initial installation has completed. 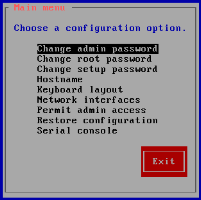 The following procedure describes how to restore your configuration at any point after installation. For a detailed description of how to restore the configuration during installation, seeSoftware Installation. • USB storage media — Migrate or restore settings using an archive stored on USB media. 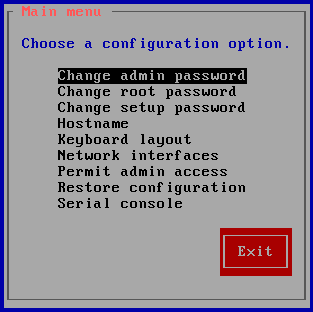 The Setup menu’s Serial console option enables you to access the Smoothwall via the computer’s serial port. This option is primarily intended for use when operating the Smoothwall in “headless�? mode, that is, without a screen and keyboard, as would normally be the case in a communication / server cabinet.